The name pretty much says it all: This app makes it super easy to book last minute flights for the spontaneous traveler. Flight Tonight, which launched in late July, is from the brains behind travel startup Hopper (founded by former Expedia (EXPE) engineers). 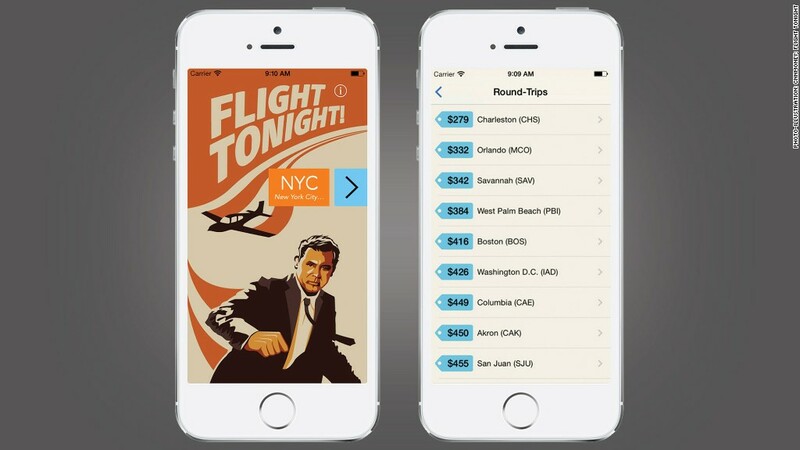 The app aggregates cheap fares from your "home" airport departing in the next 24 hours. Flights are booked through the airline or travel site, and Flight Tonight takes a standard agency commission for the referral (which varies depending on the site). "Customers have been trained that buying flights is complicated and takes a lot of time," said Hopper chief data scientist Patrick Surry. "We're saying, 'Why should it be so difficult?'" Surry said they see potential in approaching airlines to help them sell leftover inventory. There seems to be a market: In its first week, there were 130,000 flight searches in the app.